If you have attended a recent DNA class - Spit or Swab: DNA for Genealogists, you probably know the a3Genealogy team has incorporated analyzing the X Chromosome to successfully connect cousins. Like many, our genealogists are giddy over the X Chromosome. If you didn't know any better, you would think this gender chromosome was new (but you know better!). The X and Y chromosome is as old as male and female! But how genealogists analyze it to unscramble relations, is new. I'm not going to reinvent the wheel here, but I am going to offer five great reading resources. Blaine Bettinger, PhD, JD author of The Genetic Genealogist has several MUST follow posts. For the visual learner, you will love his fan charts and easy to follow explanations. Using his charts, I did a mock up of my own above. Roberta Estes' of DNAeXplained post X Marks the Spot patiently leads the reader to using the X chromosome as a genealogical tool. Emily Aulicino of DNA - Genealem's Genetic Genealogy, has done the work for us if you prefer to use an ahnentafel numbers table to specify the X-Chromosome contributors. Our genealogy database generates both the ahnentafel numbers and the fan charts. 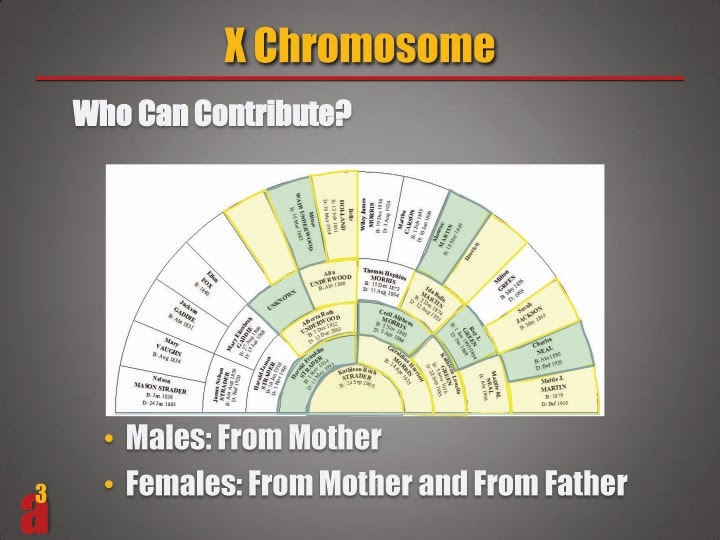 Debbie Parker Wayne, CG, CGL(sm) offers the X-DNA inheritance chart in a Microsoft Word table. We like this one. As Debbie suggests, it's easy to enter the data. Judy G Russell, The Legal Genealogist extends a lemding hand to unscrambling the confusion that comes with analyzing the X chromosome for genealogists. Whence the X walks the reader through an easy to follow case filled with graphics.